A very special beef stew for any occasion. The ingredients are easy to find and readily available in supermarkets or wet market. The way of cooking and the ingredients of this recipe is very similar to caldereta. Caldereta has a Spanish influence because calderata came form the Spanish word “caldera” or couldron. There are also many variations of beef stew but what makes this beef stew different from the ordinary beef stew is the crispy bacon garnishing. 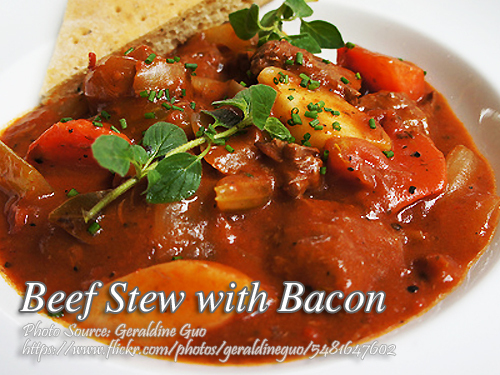 To cook beef stew with bacon; Spread bacon strips on a heated pan. Fry over medium heat until fat comes out and bacon becomes crispy. Set aside bacon, put in meat chunks and garlic. Fry until golden brown. Add chopped onions and when the onions are wilted, add tomato paste. Stir and let boil for 5 minutes and add a little water if the consistency is too thick. Add water, whole onions, bay leaf and season with salt and MSG. Cover and simmer until meat is tender. Add 1/2 cup water if sauce dries up and meat is still tough. Continue cooking. When meat is almost done, add green peas, bell pepper strips, carrots and fried potatoes. Cook for another 10 minutes. Thicken sauce with bread crumbs. Spread bacon strips on a heated pan. Fry over medium heat until fat comes out and bacon becomes crispy. Set aside bacon, put in meat chunks and garlic. Fry until golden brown. Add chopped onions and when the onions are wilted, add tomato paste. Stir and let boil for 5 minutes and add a little water if the consistency is too thick. Add water, whole onions, bay leaf and season with salt and MSG. Ad ½ cup water if sauce dries up and meat is still tough. Continue cooking. When meat is almost done, add green peas, bell pepper strips, carrots and fried potatoes. Cook for another 10 minutes. Thicken sauce with bread crumbs. Garnish with crispy bacon on top when serving.